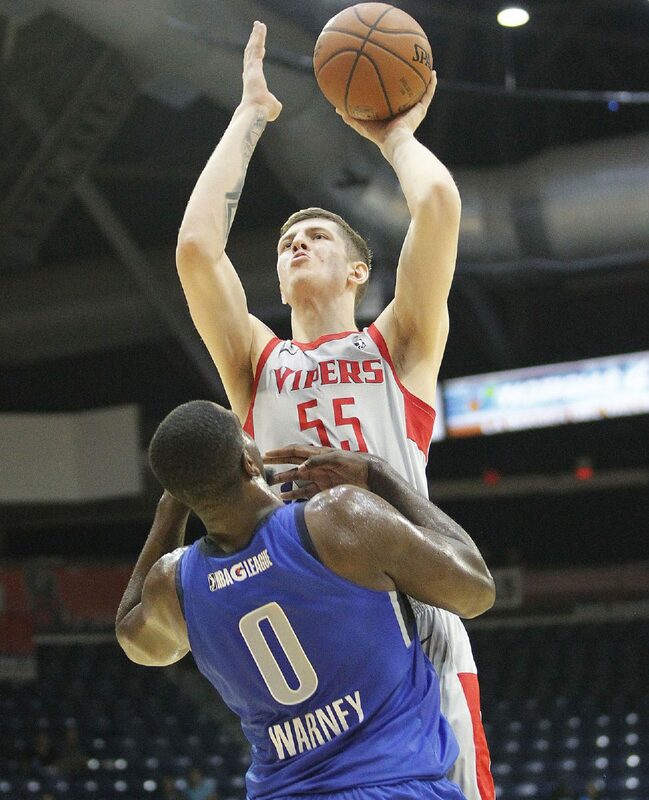 EDINBURG — Of the five players who played more than 25 minutes when the RGV Vipers last took the court on Jan. 12, only Isaiah Hartenstein was part of Thursday’s practice. Following a week filled with roster moves, the Vipers enter their contest at 7 p.m. Friday against the South Bay Lakers without seven of the team’s eight leaders in minutes played this season. Vipers coach Matt Brase regularly says that frequent roster turnover is the nature of the G League, but he said he couldn’t recall a week during his three-year run with RGV that was as tumultuous as this one has been. The G League deadline to sign players to two-way contracts was Monday, leading to a major reshuffle around the league. The Rockets waived Briante Weber, who averaged 18.2 points, a team-high 7.4 assists, 6.2 rebounds and a team-high 3.3 steals per game in 13 games with the Vipers. His rights were transferred to Sioux Falls — the most recent team to have him under a G League contract. Houston’s other two-way player, Demetrius Jackson, had his contract terminated on Jan. 6. He signed a 10-day deal to continue playing with the Vipers before inking a two-way contract with the Philadelphia 76ers on Monday. Jackson averaged 15.9 points, 4.2 assists and 3.8 rebounds per game in 16 appearances with the Vipers. One of Houston’s vacated two-way spots was given to R.J. Hunter, who signed a contract with the Rockets on Sunday. Hunter has appeared in 25 games this season, leading the Vipers in scoring at 19.2 points per game. He averaged 3.7 made 3-pointers per game, hitting 36.9 percent from beyond the arc. Hunter is expected to stay in Houston this week, given that the Rockets are short-handed with Trevor Ariza and Gerald Green each receiving two-game suspensions from the NBA following an altercation on Monday in the Los Angeles Clippers’ locker room. Injuries have also hampered the Rockets and, by extension, the Vipers. Chinanu Onuaku, who has averaged 9.6 points and 9.3 rebounds in 20 games with RGV this season, had sinus surgery on Jan. 12 and is expected to be out at least another week, Brase said. Brase said the timetable was probably similar for Zhou Qi, who averaged 12.9 points and 6.5 rebounds per game in 10 appearances with the Vipers before suffering an elbow injury playing with RGV last week. Troy Williams has reportedly been cleared following a sprained MCL that has kept him sidelined since Nov. 29, but when and with what team he will return to play remains unclear. In nine games with the Vipers this season, Williams has averaged 18.6 points and 5.8 rebounds. The Vipers will also likely be without Denver Nuggets assignment players Tyler Lydon, who was recalled Monday, and Monte Morris, who was recalled Thursday. Morris averaged 17.9 points, 6.1 assists and 4.4 rebounds per game in 25 appearances with the Vipers this year, while Lydon posted 13.4 points and 9.1 rebounds per game across 14 games. As a result, the Vipers have practiced with as few as eight players this week. Brase had 10 available for Thursday’s workout, and he said he wasn’t expecting any additional roster moves before Friday’s game. Center Isaiah Hartenstein may enter Friday’s game as the only available player who was on the floor for more than 20 minutes when the Vipers last played. The Vipers will be bolstered by the acquisition of Markel Brown, who the Rockets signed to a two-way contract on Monday. A 6-foot-3 guard, Brown was playing with the G League’s Oklahoma City Blue prior to the move, leading the team’s regulars in scoring with 17.2 points per game, including 2.9 made 3-pointers per night on 35.8 percent shooting from beyond the arc. Brown was selected No. 44 overall in the 2014 NBA draft out of Oklahoma State University. During two seasons with the Brooklyn Nets, from 2014-16, he averaged 5.3 points, 2.1 rebounds and 1.2 assists in 16.2 minutes per game across 109 appearances with 35 starts. Brown said RGV’s general concepts are very similar to what he grew used to in Oklahoma City, and he expects that his shooting prowess and ability to attack the rim will make him a natural fit with the Vipers.